Are you one of the many people who have an area of your property that is constantly flooded? Do you have a backyard that never seems to dry out? These areas can be unsanitary, unsightly, and encourage the growth of algae or mosquitoes on your property. 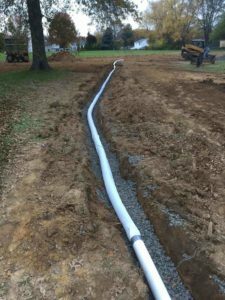 The solution to your problem may be as simple as installing a French drain, tying in your downspouts, or creating an area to contain an abundance of water. At Fox Landscape Designs, we have specialized for fifteen years in storm water management, installing French drains, as well as grading properties to prevent water build-up. A heavy rainfall or melting snow can become hazardous to your landscape if not properly taken care of. Storm water can also cause damages to your hardscape and other structures in the area, including your home's foundation, basement, and outdoor living spaces. That is why we always ensure the efficiency of every storm water management facility that we build. While there are many approaches in managing storm water, our company opted to adopt simple measures that effectively control the damaging effects of storm water. Instead of building the usual detention basins, we recommend the creation of bio-retention areas. This approach eliminates the need for a separate catch basin, which is usually unsightly. With the use of plantings, you can have beautiful gardens that also serve as catch basin for water runoff. The rain water from the roof and other areas in your landscape can be channeled to these water gardens. Another option is to use permeable pavers to help eliminate water runoffs. These pavers allow the absorption of excess water. We can also install cisterns if you want a more eco-friendly option. These solutions are just part of our comprehensive drainage management services. The type of drainage management system installed in your landscape plays a crucial role in preventing flood and rain water problems. The common drainage systems that you can find in most residential homes in Pennsylvania are downspout, slope, and French drains. Each type has its specific function, so its use will depend on the topography and size of the area. Their installation should also be handled by professionals, especially the design and construction of French drain. To be effective, the design of French drain should be large and deep enough to accommodate water runoff. The correct use of drain pipes, types of gravel, and permeable landscape fabric will also ensure that it will function properly. If you are looking for experts in the installation of these drainage systems, just call us. At Fox Landscape Designs, we create efficient drainage systems that provide exceptional results. Every drainage problem requires different solutions. A soggy yard may just need grading to redirect the flow of water. However, installation of an advanced and complex drainage system is required when your property is experiencing frequent flooding. At Fox Landscape Designs, you will be getting a comprehensive drainage management solution. Once we complete the project, your landscape will be looking better with our water gardens, and definitely flood-free with the help of French drains. Call us now so we can discuss with you our drainage management solutions. It doesn't matter whether you are from Richboro, Pennsylvania, or Princeton, New Jersey—we can still provide our services to these areas.